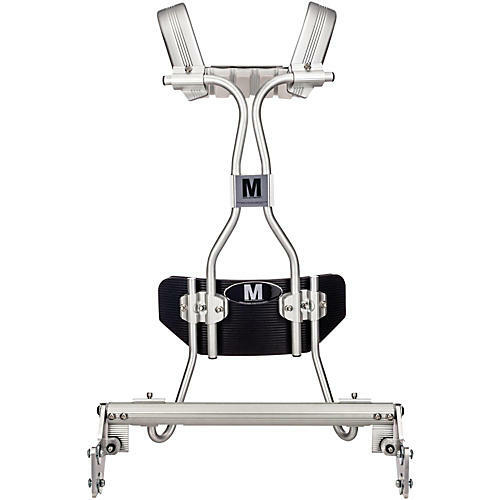 Ludwig's MAY Tube Marching Multi-Tom Drum Carrier is an ergonomically designed lightweight carrier that offers extended torso adjustment and full shoulder rotation facilitate comfort. Additionally, sturdy aluminum construction ensures strength and durability. One of the three principle points of contact between player and frame, the newly designed, tapered aluminum abdominal plate (powder coated black) can be inverted, thus enhancing ergonomic comfort with complete freedom of movement for maximum performance. Limitless adjustment possibilities are afforded through high-strength precision-drawn aircraft-grade aluminum tubing that allows mounting brackets to slide and rotate. The MAY Shoulder Adjustment System allows fully adjustable shoulders and patented backbar supports designed to change shoulder width, tow-in, camber and caster for ultimate positioning. Patented mounting hardware secures precise adjustments that eliminate slippage and unwanted rotation without excess tube stress. J-Rod Tubing clamps are used on the shoulder supports and belly plate. The backbar support area feature the patented bellowing chambers system. A series of foam pads (Comfort Care Cushions positioned by Velcro®) provide exceptional player comfort no matter how the carrier is worn or adjusted.